I like to see, and sometimes buy, traditional clothes when traveling in a new country. Though you seldom see people in poncho and sombrero in Mexico (at least in the Federal District), you can see many people in kimono in Japan, and some people in hanbok in Korea. What about France ? What is the traditional French costume? Are there places (religious buildings, ceremonies, festivals,...) where I have a reasonable chance to see them? 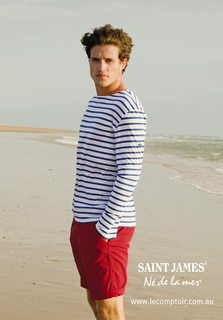 In all my time in France, I could only see the typical Western modern combination of jean/pants+t-shirt/shirt/polo. France has been unified as a country for longer than many European ones, and the 19th century didn't see the development of a specific French national costume (unless you see the international influence of French fashion as a costume issue). Even though there are some surviving bits of regional costume, there is no one French national costume. These regional costumes were largely codified in the 19th century, pretty much as they were disappearing from general use. 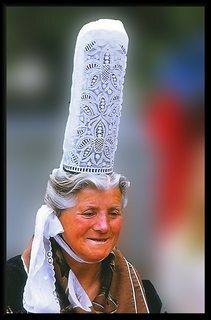 Some regions have held on longer, for instance it's less unusual to see older Breton women in lace caps on holidays than to see Alsacian women in their corresponding butterfly hats. The things that American think of as 'national' were just fashion fads (often based in former regional costumes) at times when Americans were around France a lot. So the post-WWI fad of Basque berets is perceived as specifically French, even though it's equally Spanish, and nobody bats an eye at pairing it with the Picasso-led fad for Breton striped fishing shirts (or the overlapping 50s bikinis). To this day the French are much more fashion-oriented and conformist in clothing than Americans, which can lead to endless books about how little black dresses or tan raincoats are national costumes. The authors of these books usually go home and ignore the fact that the following year the same people will all be wearing red dresses and black quilted coats, or whatever. France does not really have one national costume. 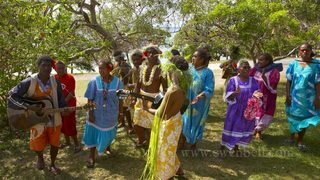 There are many regional costumes, although not many or even non is/are still used as daily dress. In the last half of the 20th century, the 'typical' French male item was a beret. And it is still used as a cartoon image for the French. It is likely as 'traditional' and 'national' as the poncho for Mexico. As your question doesn't specify it has to be in France, you may want to try Little World Museum of Man, which is in near Nagoya, Japan. You can't purchase clothing, but you can wear clothing for a small fee. Look for "Alsace village" within the park. 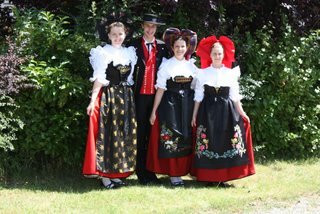 The women's dresses there are very similar to those for Alsace in Nic's answer. Even though the place may sound like a theme park, I was pleasantly surprised at how informative it was. I don't have a clue as to whether France has national dresses, or mainly has regional dresses. I assume regional dresses are just as good as national dresses for your purposes. As rather generic advice, rural areas or small towns and former colonies often keep more of a region or country's (or coloniser's) cultural heritage than the big cities. I suspect that the colonies in the Pacific are more likely to keep France's heritage than those in Africa, because the former may have less enmity towards France than the latter. But such styles are not typically described as "traditional". As you can see, they have very little in common. Not the answer you're looking for? Browse other questions tagged france local-customs culture clothing local-knowledge or ask your own question. In which countries can I find spiders as traditional dishes?